Automatic upgradation in the background so that you will be able to enjoy uninterrupted service. You can get all the services of AOL on one platform. Option to export your personal data to a file so that you can copy the same to another device. Enhanced security features and many more. AOL mail login is very easy from the app if you are using an app. Downloading AOL Desktop is different for different users. Log in to your MyBenefits page. Click on Download Now option. Once the download is completed, open file explorer from the taskbar of your desktop. Open the Download Folder. The shortcut to download folder is generally available in the left panel of the File Explorer if you are using Windows Desktop. In the download folder double click on Install_AOL_Desktop icon. A sub-window will pop up; click on Run. Click on Install Now and follow the process after that. Log in to AOL account. Go to “My Account” option on the top of the page. 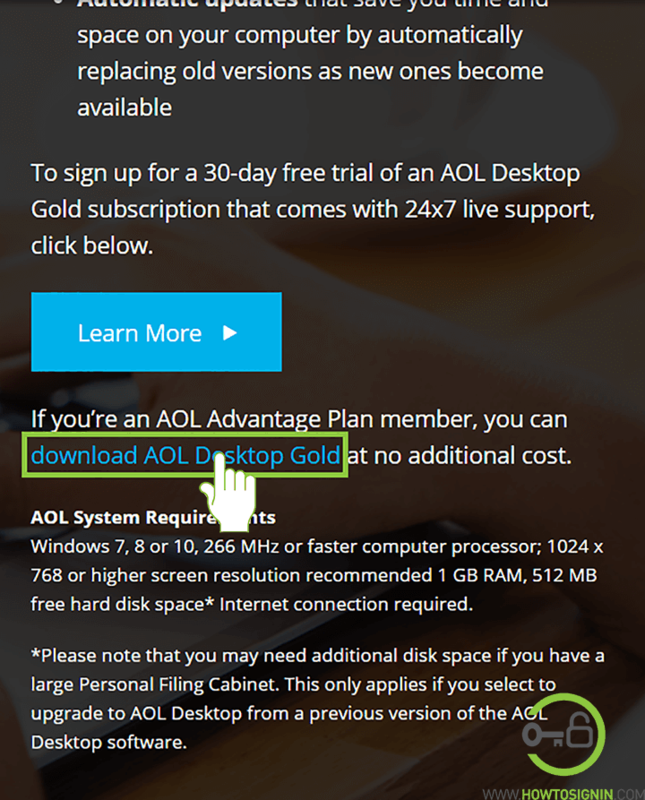 Now click on “Get Started” under “AOL Desktop Gold.” It will start the download process. Go to the inbox of your AOL Mail account. Unable to login? Reset AOL password and try again. Either scroll down and find the email from AOL with subject tag “Get started with AOL Desktop Gold” or search it on ‘Search Mail’ box on the left sidebar. Open the email and click on “Download AOL Desktop Gold” or “Update Now”. The download will start. After completion, install it in your PC/Laptop. Visit AOL discover page for Windows desktop. Now click on “Learn More” under AOL Desktop Gold. Select on “Try it free for 30 days”. If you are not already signed to AOL account, you will be asked to Sign in. Click on Sign in and enter AOL email or Verizon email and then enter the password associated with the account. Enter your basic billing information including your credit card number and phone number. You will be charged as soon as your trial period ends. 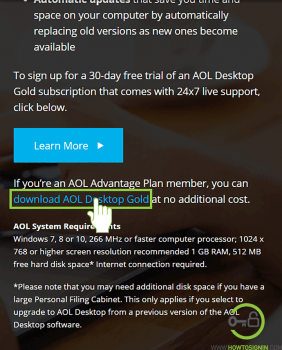 If you don’t want to continue using AOL desktop paid service, you should cancel the subscription before the trial period ends. After you are done providing all the information, click on “Start your Free Trial”. Now click on download now. As the download is completed, follow the installation process as mentioned above. Your Windows operating system should be Windows 7 or newer. Hard disk should have at least 512MB of free space. Computer processor of 266 MHz or faster. The latest version of web-browser is recommended. Reasons to Download the AOL app for your mobile phone. Notification: On the AOL app, you’ll get a notification for important email and breaking news, so you don’t miss anything. Stay informed about current affairs, either it is politics, finance or news about your favorite celebrities. Manage Emails and Contact: You can manage all your AOL emails from the app. You can send, receive and manage your emails from the app easily. Also, add multiple AOL account, send messages and access all of your phone AOL contacts from the app. News: On AOL mobile app, you’ll get the latest news on current world and US affairs. You can also read or watch the news on sports, lifestyle, finance, and weather. The news source includes AOL Finance, AOL Sports, TechCrunch, HuffPost, Engadget, etc. Web Search: You can search the web right from the AOL app. Weather: Get the accurate weather forecast for your area. You can also check the daily or hourly forecast. Open App Store from the iPhone menu. Search ‘AOL’ on the search icon inside the App Store. Open Google Play Store from the mobile menu. Search AOL app in the Play Store.